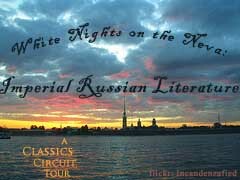 Beginning Monday, June 21, 2010, we’ll be celebrating White Nights on the Neva as Imperial Russian Literature goes on a virtual tour of the blogosphere. Check out these participating blogs where you’ll find reviews. The button for this tour is a picture of St. Petersburg and the Neva River on a “white night.” It was taken by Incandenzafied of Flickr and used under a Creative Common License. The caption for this image on Flickr? “Yep, real pretty there.” Feel free to use the button to promote your participation in the blog tour. Please download it to your computer first. This entry was posted on May 26, 2010, 6:45 am and is filed under Coming Soon. You can follow any responses to this entry through RSS 2.0. Both comments and pings are currently closed. I never “got” Chekhov, but this list is reminding me that maybe it’s time.